"Be Active, Be Strong, Be Active , Live Long"
Thanks to Seamie Harding and Declan Flynn from the Shelmalier Ladies Football for all the fun skills and drills we did today. 6th, 5th, 4th and 3rd displayed great potential. Congratulations to Cian Doyle in the senior end on choosing the St. Ibars N.S. motto 'Be Cool Be Active'. Congratulations to Harry Hillis in the junior end on drawing a fantastic picture on what Active means to him. 5th class are steaming ahead with over miles clocked up at the end of day one. 2nd class are putting in a massive effort with miles on the board. Keep up the good work! Thanks to Whites and the Maldron for their free swim pass per pupil. and physically active school community. St. Ibar’s N.S is a very active school and we are hoping to get our second Active School Flag this year. To achieve the flag we will work on new innovative exciting ways to encourage all pupils to become more active. We will endeavour to get pupils more active at playtime as well as providing opportunities to experience a wide variety of sports as well as maintaining sports more traditional to our school. 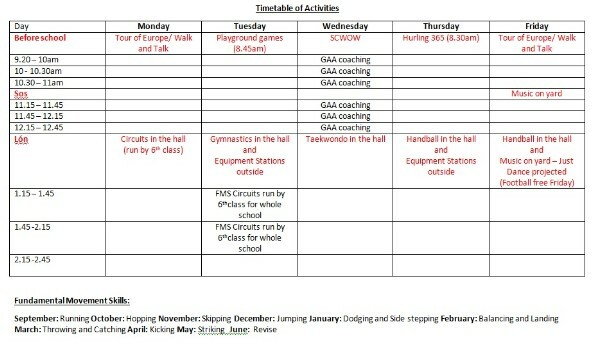 Having put together a committee of excited and inspiring members of our school community, we began reviewing our School PE Plan, the development of resources for all strand areas and we organised the printing of Lesson Plans for all classes, in all strand areas. The Active Flag committee organised an active slogan competition for pupils. The winning slogan will be prominently displayed on the active school notice board. • This year’s football Rackard League season has come to an end and the boys and girls of Castlebridge have done themselves proud. The girls played excellently throughout the group games and were successful in getting to the final where they will face Bree. Best of luck to the girls and their management. • The boys had a large panel and were in a position to enter two teams, one into the Rackard League competition and one into the Rising Stars completion. The Rackard League boys were outstanding in their group games, winning all of their games. Unfortunately they were defeated in the semi final by a strong Kilanerin side however. • The children in 4th, 5th an 6th classes recently took part in a lunchtime gaelic football league. Anthony Masterson, along with the class teachers put the teams together and played 7 games each. Credit must go to the captains and managers of each team who ensured that their teams were organised and aware of all tactics that were to be applied in each game. There were many thrilling games as well as exceptional team play and outstanding scores. Well done to all the children who participated and best of luck to the winners Tyrone as they move on to represent our school in the county competition. • Many of the children have recently taken part in the Hurling 365 initiative. The children have shown great dedication to their sport by coming to school at 8.30am for the last five Thursday mornings to take part in games and drills in order to improve their hurling skills. It is fantastic to see more and more boys and girls coming to take part in the games each week. Well done to Mrs. Hearne for organising the event and to Willie Cleary and the coaches from the Shelmaliers who give up their time to provide the boys and girls with such fun and games . • The boys and girls in 4th class recently attended an indoor soccer tournament in St. Joseph’s Community Centre. They children represented their school excellently and did very well to reach the semi final where unfortunately they were beaten by Crossabeg. The boys and girls displayed great skill and teamwork throughout the competition. Well done to their coaches Ms. Hayden and Ms. Higgins on their managerial debut. Our garden committee led by Regina Kehoe meet once a week to get active planting. We are participating in the incredible edibles which our Active garden committee will sow. • Turn up the music and boogie down! • Make a game out of household chores. • Sneak workouts into other activities i.e. taking the stairs instead of the escalator. • Turn TV ad breaks into fitness breaks. • Have a weekly sports night, where everyone in the family gets involved. • Let the kids help with work in the yard and with gardening – catch leaves, raking, sorting, digging, planting, etc.